The Insignia Platinum 1100mm x 700mm is another wonderfully crafted model in our 2nd generation leak free and fast build showers. This top of the range Platinum steam shower has an abundance of superb features to boost your Insignia Shower experience. The luxurious stainless-steel monsoon rain shower engulfs you in complete water immersion. Alternatively, you have the baton style brass hand shower, available on an easy to use riser rail for optimal height setting. Want to sit and relax? It’s easy with the white wood effect seat and soothing body jets. Why not take relaxation a step further with the simplicity of one touch steam, rounded off with music of your choice and your favourite Insignia aromatherapy essence infused into your steam. 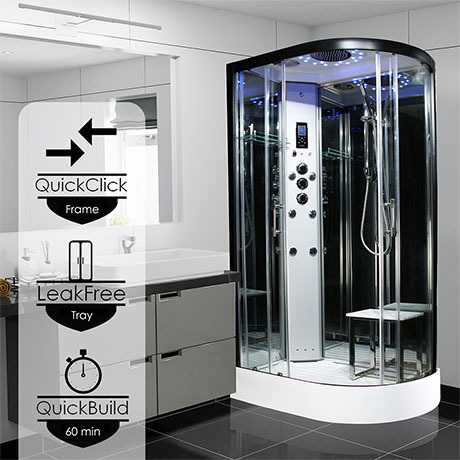 The multi-coloured roof lighting and twin speaker system activated by Bluetooth touch control, complete the total luxury package of your steam shower. You need 2.5 - 3.00 bar pressure supply. Combi boiler normally great, older tank systems may need a pump. A 13 amp fused spur is required to provide eletricity to the shower. The shower is supplied with a 3 pin plug with an RCD fitted for your safety. All our shower are supplied in 4-5 boxes which are designed to be easily transported to your premises and carried in to your bathroom.